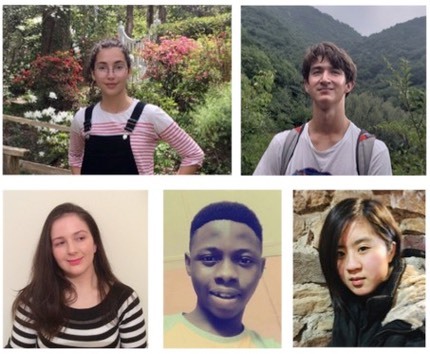 Poets from the USA, Nigeria and Ireland are finalists Young Poets’ Prize in this year’s international Hippocrates Prize for Poetry and Medicine.� The Young Poets’ award is supported by healthy heart charity the Cardiovascular Research Trust, which has a particularly interest in promoting heart health among the young throughout the world. The shortlisted poets are Adetona Temilade Adedeji from Lagos, Nigeria, for E.R; Rebecca Byrne from County Carlow, Ireland for The Butcher's Doll; Emily Liu from Naperville, Illinois, USA for Sublimation of Memory; Miles Johnston McInerney from La Jolla, California, USA for Seeking Cracked Boys for Clinical Trial; and Maia Siegel from Roanoke, Virginia, USA for I Woke Up Blind One Day. Left - right: above�Maia Siegel�and �Miles Johnston McInerney; below Rebecca Byrne,�Adetona Temilade Adedeji and Emily Liu. Winners of the Hippocrates Young Poet Prize and the FPM-Hippocrates Awards will be announced on 17th May at the�2019 Hippocrates Awards Ceremony at the Centre for Life in Newcastle-upon-Tyne in England. She added: "After reading the entries from 15 countries in this year’s Hippocrates Young Poets Prize I feel sure that the future of medicine and the interaction between medical professionals and patients is in good heart. “Jane Austen did not think suffering improved temperament and many poems emphasised the diminishment that pain brings. I’d like to congratulate all the poets who entered and urge you all to keep on writing and observing. Remember: doctors make good poets and poets make good doctors." The Hippocrates Young Poets’�Prize is a �500 award for�an unpublished poem in English on a medical theme.�Entries are open to young poets from anywhere in the world aged 14 to 18 years. There is no entry fee for the Young Poets prize. The�Hippocrates Initiative�for Poetry and Medicine�– winner of the 2011 Times Higher Education Award for Innovation and Excellence in the Arts – is an interdisciplinary venture that investigates the interface between�medicine, the arts and health. The 2019 Hippocrates Young Poets Prize is supported by�the�Cardiovascular Research Trust, a healthy heart charity founded in 1996, which promotes research and education for the prevention and treatment of disorders of the heart and circulation.�The charity has a particular interest in avoiding preventable heart disease through educating school students. Recent activities include a Love your Heart poetry collection by primary and secondary school children based on school lessons bringing together heart education through poetry. The charity also supported the Hippocrates Book of the Heart, launched in Sydney, Toronto and London, bringing together poems on the heart by famous poets from around the world with advice on how to prevent and treat heart disease by medical experts on the heart. Hippocrates Young Poets’ judge Elizabeth Smither�has published 18 collections of poetry. She was New Zealand’s Poet Laureate from 2001 to 2003, and was awarded an Hon DLitt by Auckland University and the Prime Minister’s Award for Literary Achievement in 2008. She also writes novels, journals and short stories, and is widely published in Australia, Britain and USA. She was awarded the Sarah Broom Poetry Prize in 2016 and her most recent poetry collection,�Night Horse,�won the Ockham NZ Book Award for poetry in 2018.